Therm-a-Rest Tranquility 6 Footprint. Preserve the floor of your Tranquility 6 tent, or create a stand-alone shelter with the Tranquility tent’s rainfly and poles. 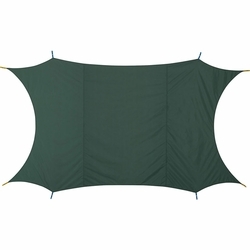 The Tranquility 6 Footprint perfectly matches the size of the Tranquility 6 tent to protect its floor from damage. But there’s more. The Footprint is also compatible with the tent’s rainfly so you can create a stand-alone shelter. Multi-Functional: The Tranquility Footprint is compatible with the Tranquility tent’s rainfly and poles to create a stand-alone shelter.